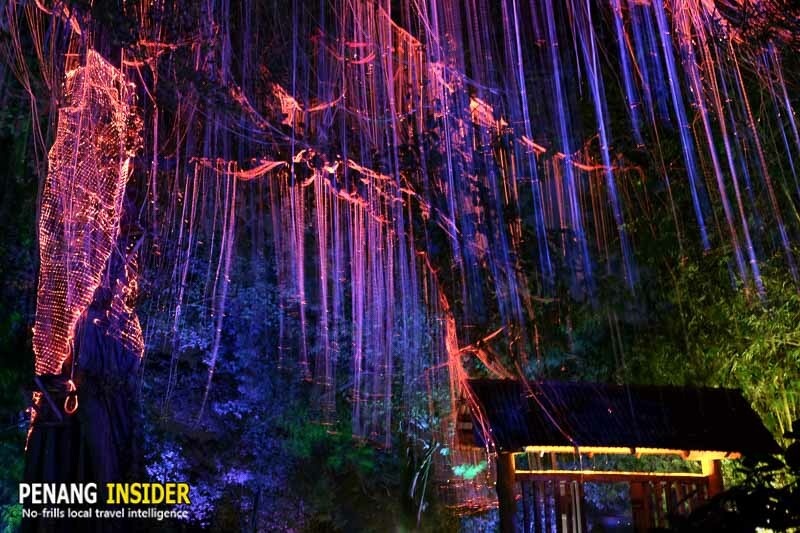 Did you know that Penang has a place that looks like the Tree of Souls of the blockbuster movie Avatar? It’s Penang Avatar Secret Garden in Tanjung Tokong, a place that has become a very popular attraction on most Penang itineraries. To be honest, we are not big fans of tourist spots, especially those who copy or replicate other ideas. But after a trip to Penang Avatar Secret Garden, we kind of liked what we saw. Why? 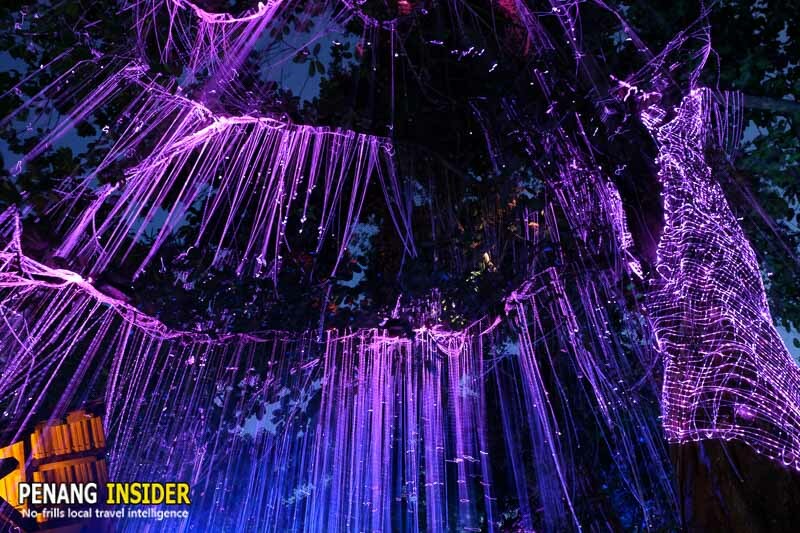 It’s a good place to visit at least once and enjoy the light show created by the LEDs draped on the tree. 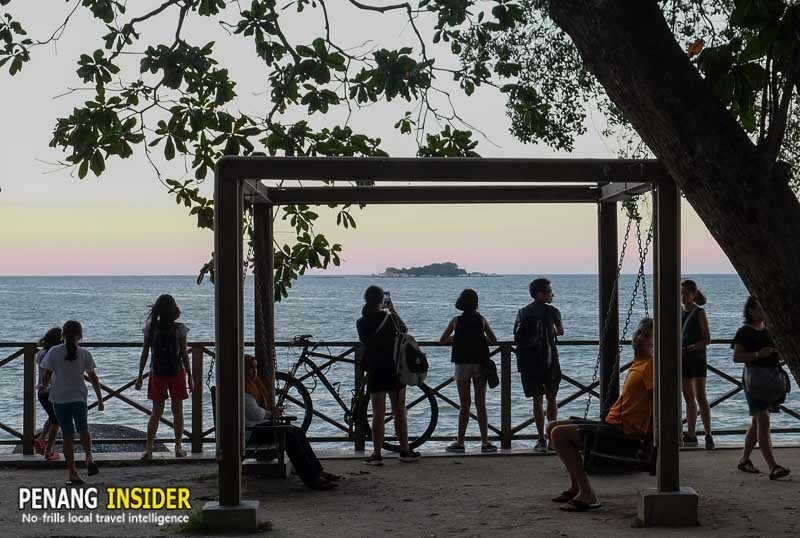 It’s good to bring children, too (did you check out our list of 32 Amazing things to do in Penang with Kids?). And it’s even a better spot to take great shots of Penang’s coast at sunset (more about this below). But we also experienced one main issue we found very annoying, and thus decided to write this guide to survive, and enjoy, the Avatar Secret Garden in Penang. Don’t make our same mistakes, and have a good time! How to Get to Avatar Penang Secret Garden? Avatar Penang Secret Garden is located in Tanjung Tokong, right next to the Thai Pak Koong temple. You can see a map here. What is Avatar Penang Secret Garden? 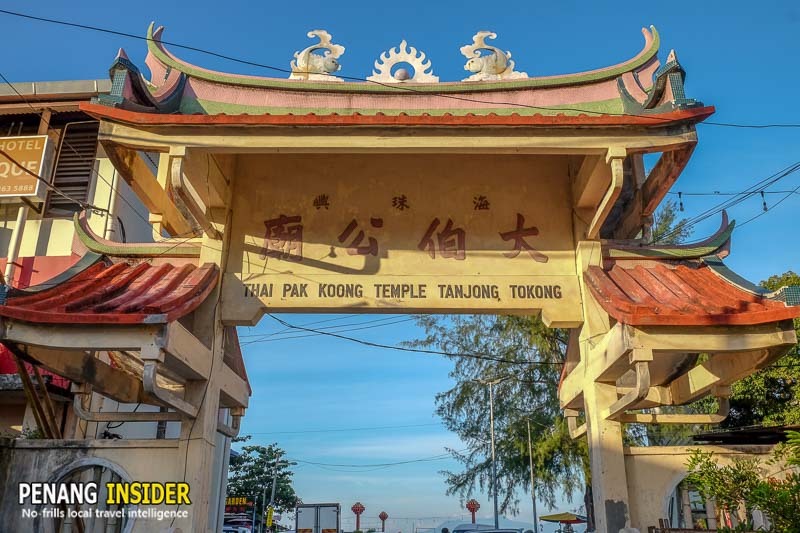 A few words about the past: before Avatar Penang took over as the main attraction, the beach beyond Thai Pak Koong temple was one of the quietest, lesser known in the Tanjung Tokong area. 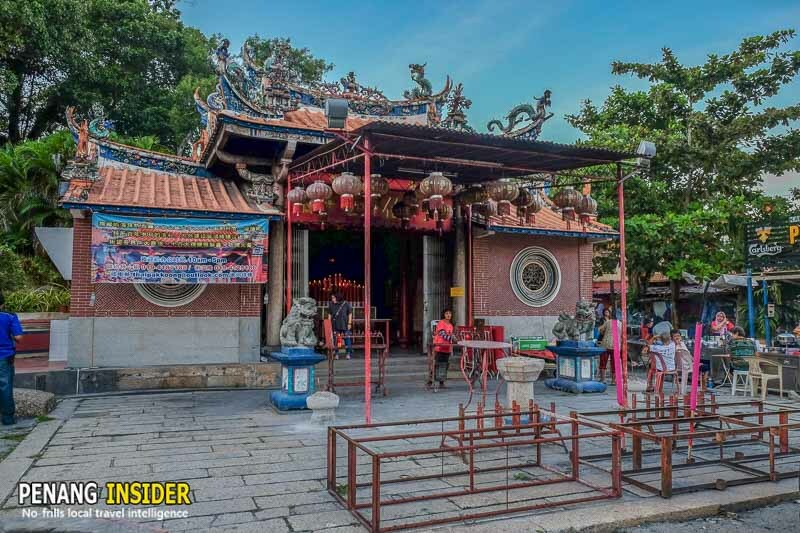 Some of my friends used to come to surf here, and I had already visited several times over the years because the little village of Chinese fishermen living around the temple is a good example of a disappearing way of life on Penang Island. 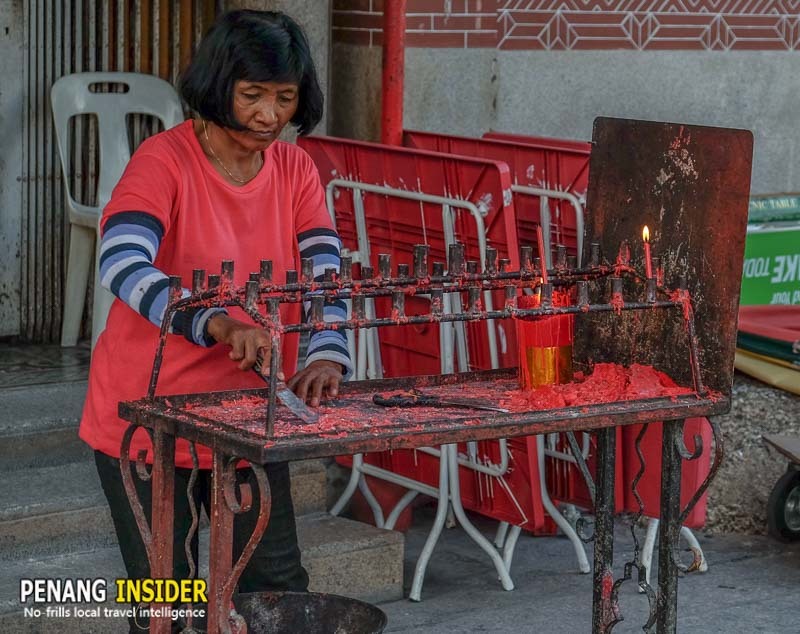 Don’t forget that it’s also here at the Thai Pak Koong temple that the “ritual of the flame” (Chneah Hoay, predicting Penang’s economic performance for the next 12 months) takes place every year on the 14th night of the Chinese New Year. It’s the eve of Tua Pek Kong’s birthday, to whom this temple is dedicated. The “Grand Uncle” is worshipped here in the historical impersonification of Zhang Li, a Hakka scholar who shipwrecked on Penang island while on his way to Sumatra. That’s how, according to folklore, this Chinese settlement in Tanjung Tokong was born. But these days, nobody seems to remember the Thai Pak Koong temple and its community — everyone comes here for Avatar Penang Secret Garden. This park was built just over a year ago, and its main feature is a “replica” of Pandora’s Tree of Souls that most of us saw in the American blockbuster Avatar. 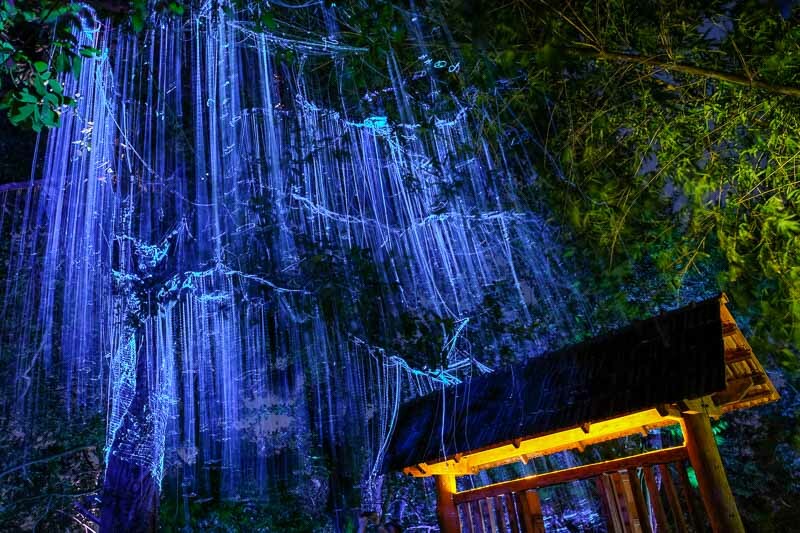 There is no entrance fee to Avatar Penang Secret Garden. At least, there is no fee which is collected near the attraction’s gate by anyone related to MBI – the company who sponsored the construction of this site. The problem is the mafia of parking guys who have taken over the space in front of the Thai Pak Koong Temple. They charge an RM1 “maintenance fee” on top of the RM5 they want for one parking spot. I was asked RM2 to park a small motorbike (4 times a normal price) and politely turned around and left. After leaving my bike free of charge at the beginning of the access road, I returned and asked, since I was still waiting for a friend, if I could walk to the beach — which has always been a free, public property — before going to the Avatar Penang Secret Garden. I told the parking guy that I’d pay my entrance ticket later, just when my friend would show up. The Chinese parking man didn’t understand my question, even if I repeated it four times (including one in Hokkien, translated by my wife). But when I politely declined to pay to access to a public beach, he started screaming at me (a very aggressive reaction for a Penang Chinese person) and blocked my way until I paid up. Now, you may think I am crazy — quarrel for one ringgit. Truth is I just hate Mafioso-types and people who yell in my face. I hate it even more when — as you can see from the picture below — there’s not much “maintenance” going on at Avatar Penang Secret Garden. The beach is filthy with rubbish. And people at the Thai Pak Koong temple told us that they have nothing to do with the actions of these parking guys. Possibly true: if you walk outside the temple’s archway going toward the highway, you will see at least 3 groups of different parking guys who fight each other to get visitors space in one of the parking lots they manage, earning commisions for themselves. And just for the record of greediness, RM5 for parking is not even charged at some of Penang’s poshest shopping malls. CONCLUSION – Avoid paying RM5 and being a victim of some unhealthy attitude by parking your car away from the access road to the Avatar Park Secret Garden. You could, for example, park at the Tesco nearby, and walk for less than 10 minutes to the Avatar Park. Or, even better, get a Grab from George Town. The main attraction at Avatar Penang Secret Garden is the landscaped park set on the hill behind Thai Pak Koong temple. 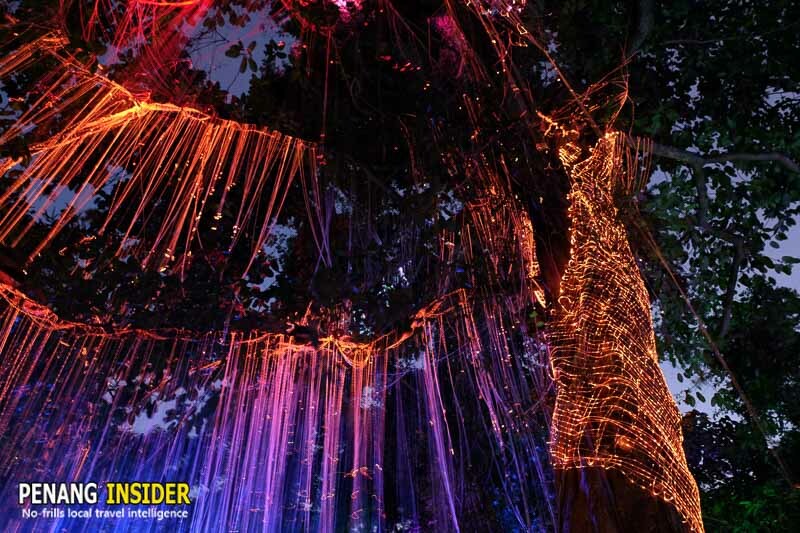 Its centerpiece is, of course, the big “Tree of Souls” decorated with LED strings. It comes alive as soon as darkness falls. The tree soars above a life-sized checkerboard, and there are stairs and a wooden boardwalk to complete a quick circuit around the tree and back down. Honestly, it’s a good place for a romantic date or bringing your children, but the park itself has limited appeal — we spent about 30 minutes in total, and mostly because we were taking photos for this article. When shall I go to Avatar Penang Secret Garden? The light show starts right after sunset around 7.30pm, but it’s best to arrive about an hour earlier and walk around the beach. There are several rock statues and sculptures on the shore, including a giant turtle and Chinese deities. At the right side of the beach itself, you may see one of the two bunkers built here during War World II to safeguard the coast. They, too, like the tree, are draped in LED lights and come alive after dark. 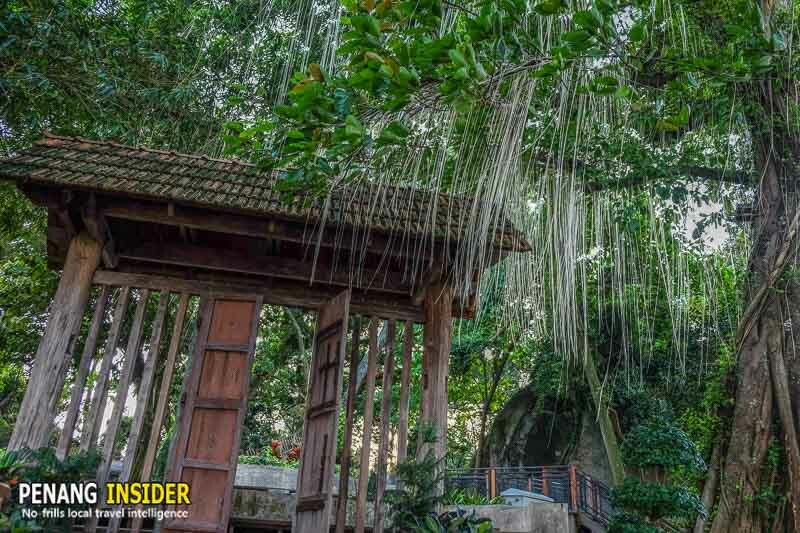 During the day, they are often used for photo sessions and offer an interesting aspect of Penang’s history you may want to check out before visiting Penang Avatar Secret Garden. Thai Pak Koong temple itself is a nice place to visit, filled with candles and joss sticks. You can observe people attending to the worship jars, cleaning them up and lighting up joss sticks. Certainly, it’s an interesting Chinese temple that’s maintained pretty well. 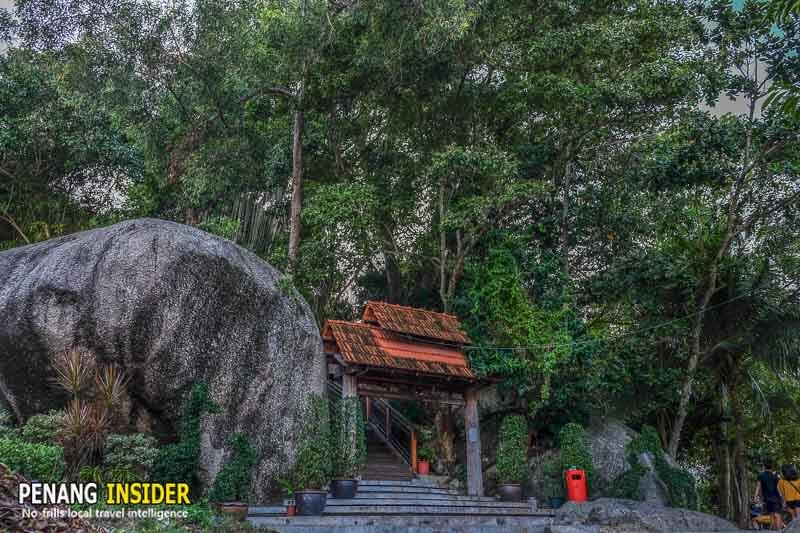 Just turn left behind the Thai Pak Koong temple, but instead of climbing the staircase that leads uphill to the Avatar Penang Secret Garden, stay down and reach the viewpoint overlooking the sea. 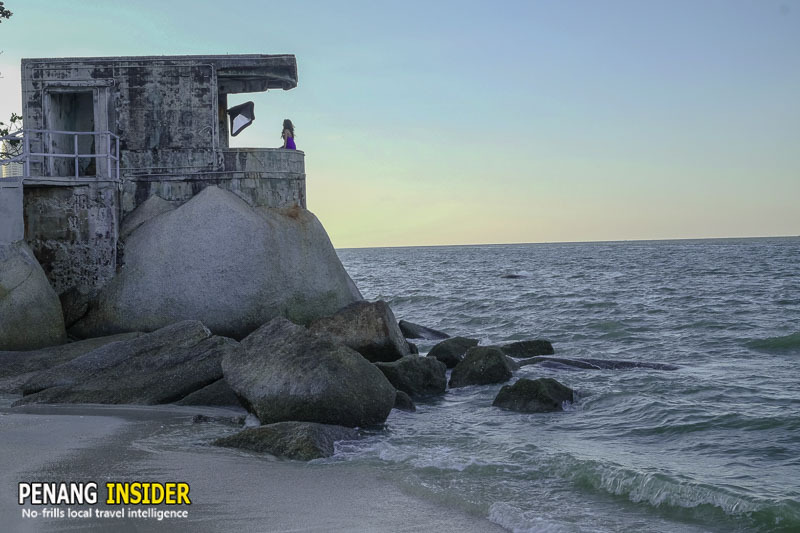 This is where a statue of Tua Pek Kong sits observing the waves — like Zhang Li the adventurer used to scan the sea — and where visitors can find a seat and relax enjoying the sea views. The suggestion is to not just remain here, but walk down the staircase and seat over one of the boulders that raise from the beach. We believe this is one of the best corners of Tanjung Tokong to see the sunset. It’s also ideal for photographers, who can use the rocks to set up their tripods and take some very atmospheric slow shutter speed pictures of the bay, making the ocean look like silk. How long shall I stay at Penang Avatar Secret Garden? All in all, we think that by arriving at 6.30pm you can comfortably see the temple and enjoy the sunset, walk up to the Penang Avatar Secret Garden and enjoy pictures under the glowing tree. By 7.30pm your visit will most likely be over, just in time for dinner. Where to eat at Penang Avatar Secret Garden? Forget the overpriced seafood restaurant on the premises, Pearl Garden, and head out on the main road to Batu Ferringhi. Turn right and walk 3 minutes to VIVA Food Court, which offers some Penang iconic foods. 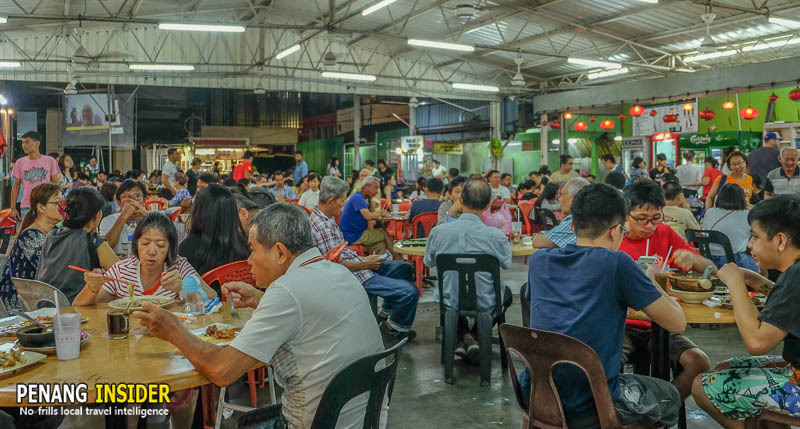 In tone with the area — Tanjung Tokong is among one of the high-cost places to live in Penang— the food here is a little bit more expensive than in other George Town food courts. But the quality is pretty good, with large portions. I had a delicious claypot chicken rice. 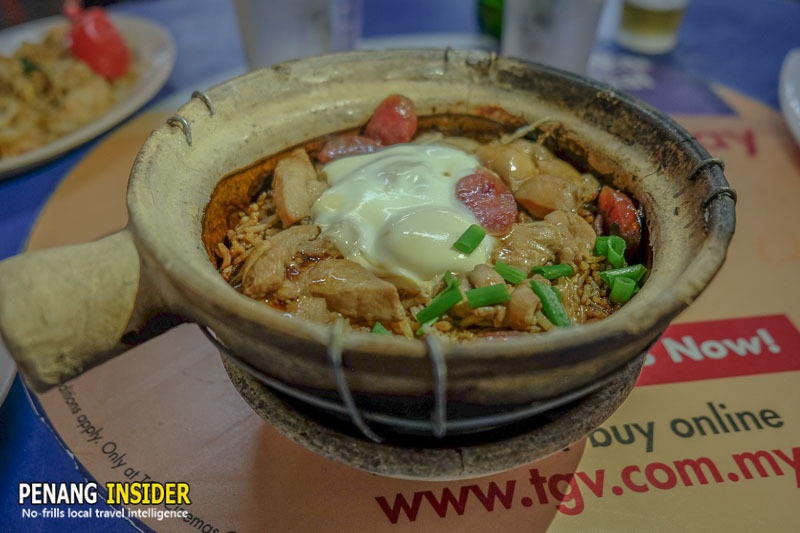 For 7RM, I ate a big clay bowl filled with chicken meat, rice, and topped with an egg. Pretty good food. 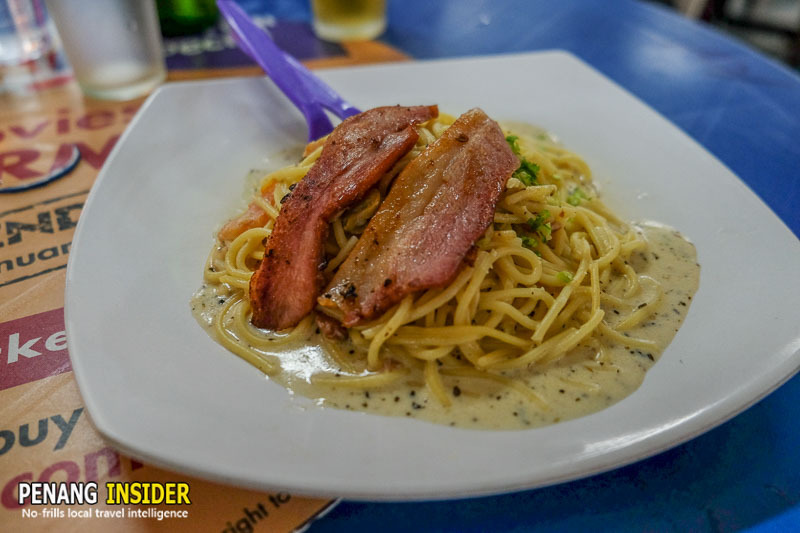 My friend, expert landscape photographer Pete DeMarco, who invited me to check out Penang Avatar Secret Garden, order a carbonara pasta topped with duck (nice local spin) for RM9. I didn’t try it, but Pete seemed pretty pleased with it. This place is pretty and original for what it is, but it has already become a super-touristy spot. Tour operators now whisk Mainland Chinese and Taiwanese tourists here, and hence the place gets congested at sunset. This reflects in the very impolite behavior of the parking people: just DON’T PARK HERE. Again, take Grab or park at Tesco in Straits Quay and walk to the Avatar Penang Secret Garden in a mere 5 minutes… it’s good for your health, trust us. 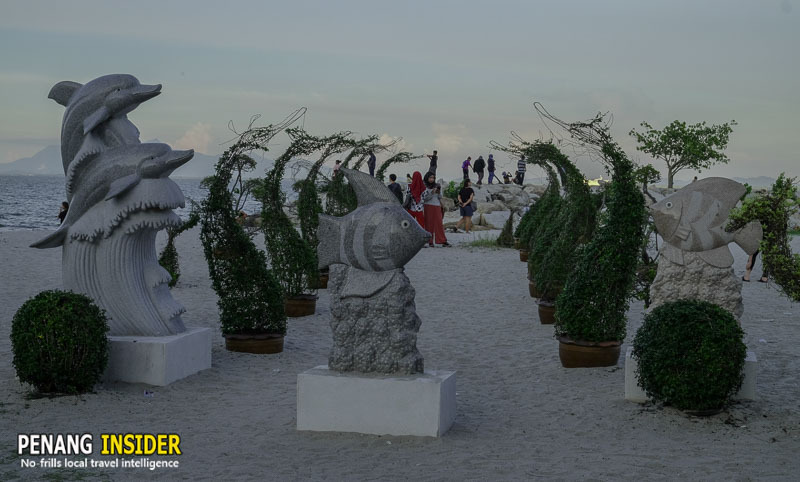 We doubt we’ll make this a top priority, unless we are taking around some friends from out of town, or we are already in Tanjung Tokong around sunset time. For that, of course, the beach with the boulders remains a very cool place to soak a tropical pink sky in Penang’s Tanjung Tokong.